A client of mine bought an LRB M25 from Cabela's bargain cave for around $2,500. 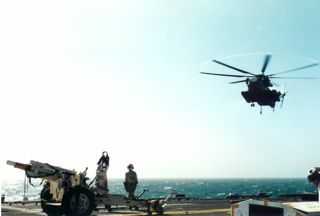 It had a Kreiger heavy 22" barrel and a JAE-100G3 chassis. 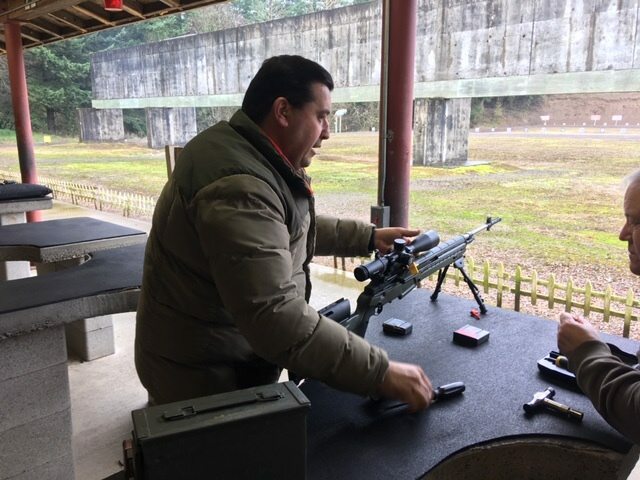 He didn't like the chassis and wanted me to pull it and bed it into a McMillan M3A but his buddies (who shoot AR-10's) prodded him to get his rifle ready for an upcoming tactical match. I convinced him to run with the JAE until his McMillan is on order (9 month lead time). 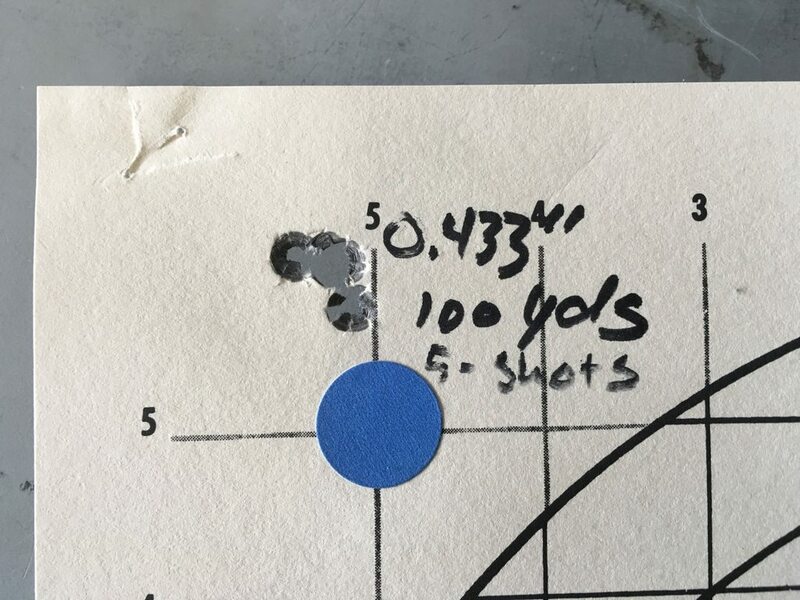 I met him at the range today and helped him get a new high end Bushnell scope installed and we tweaked the barrel tensioner and got him on paper out to 100 yards. He was doing well and shot around a 1" group with 168 grain Federal Gold Medal Match. In the back of my mind, I knew he was a relatively inexperienced M14 shooter. I asked him if I could run few rounds through it to see what I could do with it. After two shots, there was only one hole and the owner of the rifle was looking through the spotting scope and gasped "NO WAY!!!" Three more shots and a few more comments from the owner and we were left with a 0.433" 5-shot group. I commented that that may be the smallest group I've ever shot with any rifle ever. To date, the best I've ever done with an M14 was my personal M25 in a JAE at 200 yards with a 1.2" group. I had Wes Howe with me (a member on this forum but doesn't post much) and another moderator from the M14 forum. The owner of the rifle had a great time and we asked him what he wanted to do with the rifle. He's unsure now as he never expected to own a rifle that would shoot that well. He may just leave it as is and focus on overhauling his SAI scout now. I at least showed him what the rifle could do and now he can focus on becoming a better shooter. He was pretty shocked and fired up at the end of the day. ETA - Just googled 'JAE-100G3 Chassis' to learn what it's all about, and why I might want one....And low and behold, 'J.Allen' Enterprises! Of course, the very next thing(s) listed in the google search after the jallenglobal.com website were three videos by tonyben3....That's Pretty Cool too! The M-14/M1A is one of the guns that has intrigued me, but I've never actually shot. So many guns, so little time/money. Nice shootin! I would have loved to see a pic of the gun too. Thanks guys! One last thing I told him was that whenever he shoots a group like that, the best thing he can do is pack up and go home. Call it a day. BE DONE, which is exactly what I did after shot that group! I e-mailed the owner and asked for some pictures. I'll post them when I get them. It looks exactly like mine excepts his is dark green and mine is coyote brown. Wow, that's outstanding! I was digging the groups you posted with the M21 DMR in the other thread. A shooter like that, no way would I pay $ to re-stock it. I wouldn't touch it, it is working. That is super nice! I also agree that the owner shouldn’t do a damn thing, other than practice. I’ll likely be inquiring with you to install the op rod guide on the barrel in the near future. I don’t have the necessary tooling for that. I’m only waiting on the stock and (eventually) a US Optics scope with Atlas bipod. A Windtalker suppressor (likely) would come even later. I’d be thrilled to get groups even close to that one. Nice shootin! The last example of a M1A that I fired was a friends money pit of a rifle. Stainless match barrel and many other custom parts, he was having issues with a scope mount. We did figure out the fix and moved to 200 yds for a zero check. I got behind the gun with his 168 SMK hand load and fired 5 into 3/4". Had to be a fluke of nature, my bolt gun can do it, but this thing just amazed me. Sadly, he sold that rifle before I had a chance to make an offer. I test fired another recently that needed some benny6 attention. 2 1/2 " groups at 100 yds. Yeah, that is a rifle you just leave the heck alone. Absolutely, no touch! Congrats on a great touch on that trigger. Here's the only pic he took yesterday while I was installing the scope. Quick, smear Lock Tight on everything! That's awesome. I wouldn't touch a thing on that rifle. Nothing. You make magic with m14s. I am very impressed. My next project is a precision SOCOM. My Criterion 16” barrel should be here Monday.